We have been making observations even before we were born. Perhaps, it is part of human nature that makes us become observant of what is around us. Often, we don’t choose what we notice. We just observe them to satisfy what we think and feel on the spur of the moment. And because we are naturally observant of what is around us, through time we are able to answer tons of questions, solved a lot of mysteries, and fixed numerous problems. Because of the importance and benefits brought about by making observations, studies were made to improve and organize how an observation should be done through the creation of observation techniques. Different types of observations have also been made in order to make the process more systematic and convenient. 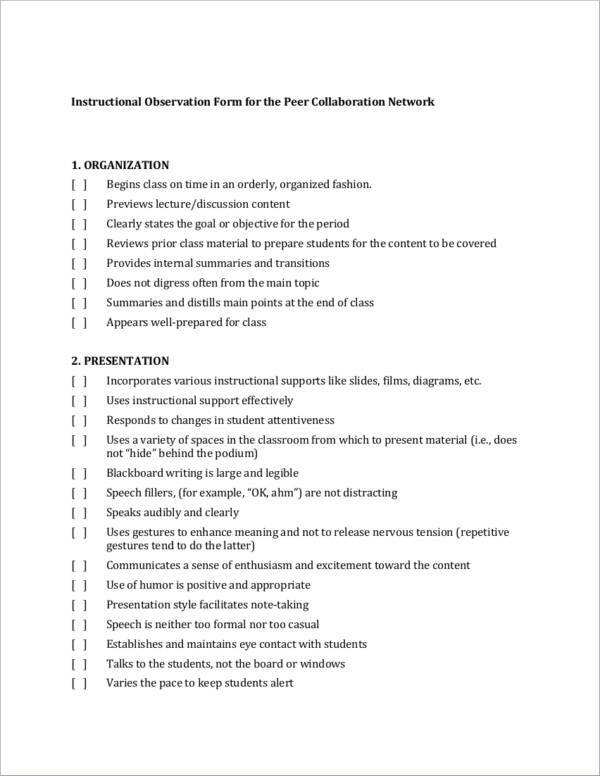 There are just a lot of things that can be done about making observations and this leads to the creation and use of an essential tool known as an observation checklist. As there are a lot of activities or tasks involved in doing or conducting an observation, it is almost impossible to remember all of them mentally. 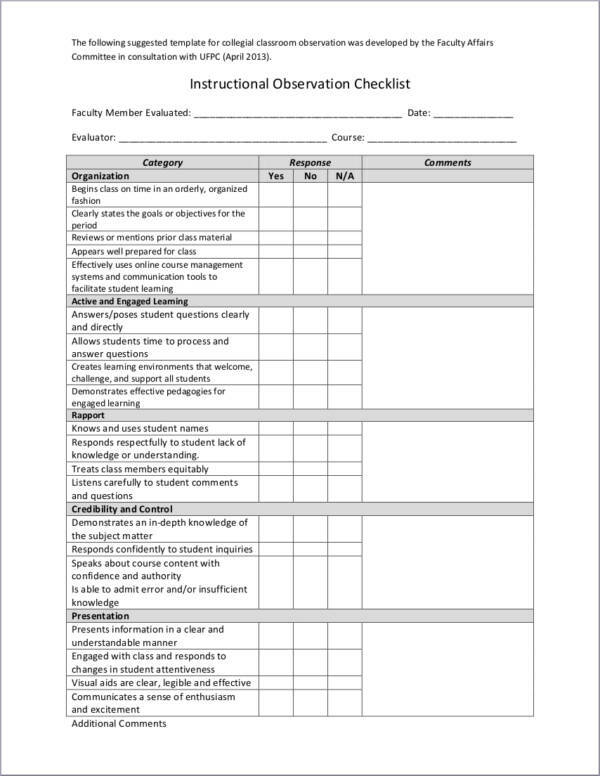 Observers who are conducting or who will be conducting an observation, regardless of the nature of the observation to be done, need the help of an observation checklist. 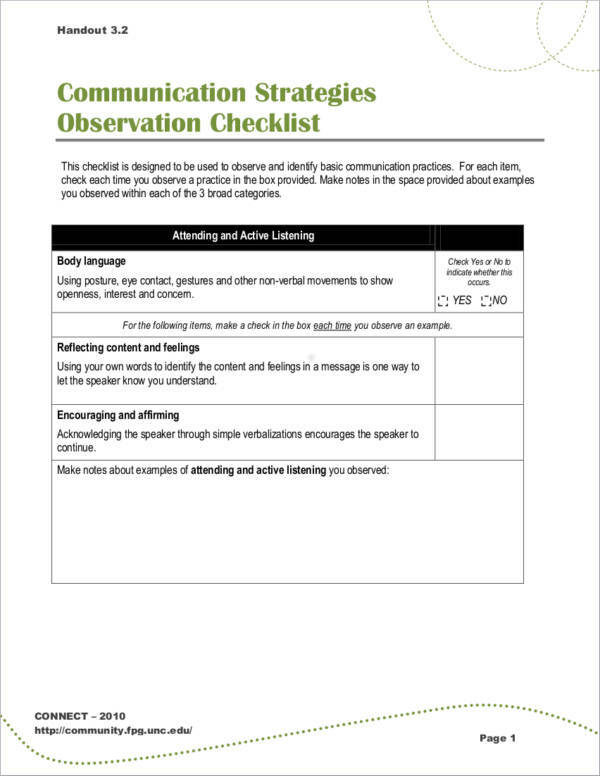 An observation checklist will list all of the things that an observer needs to look for when conducting an observation. It is the tool that they first look at to be able to conduct a useful and effective observation. It also helps in producing desirable and goal-oriented results as the focus of the observer will be directed to what is required in the observation. 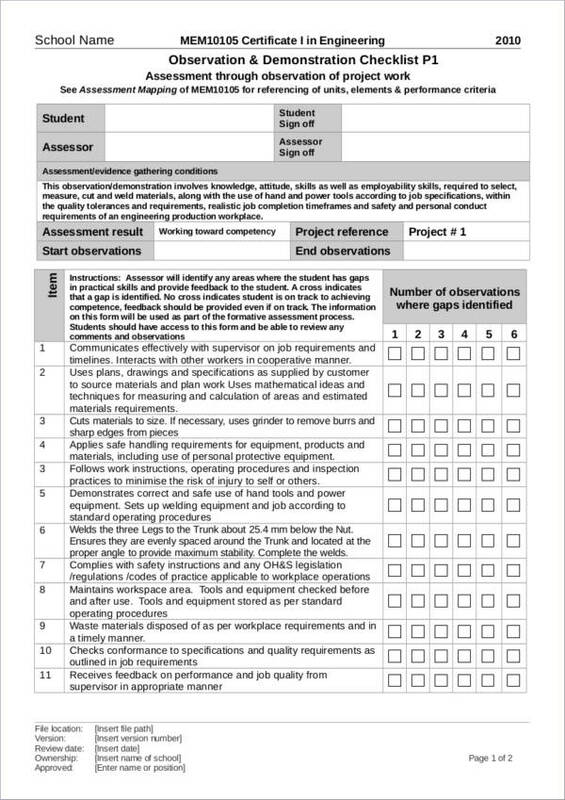 Since there are different observations conducted for specific purposes, the goal and contents of each observation checklist are also different. 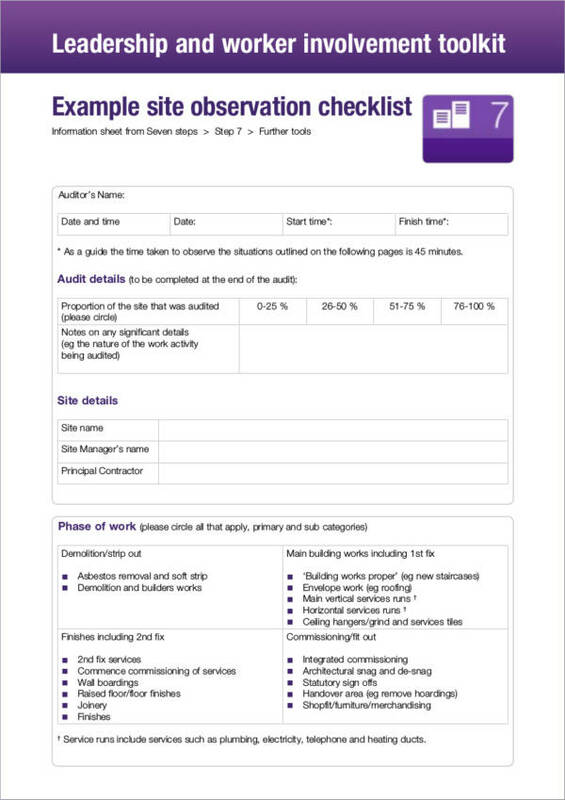 If you try to look at some observation checklist samples or observation checklist templates, you will be able to see different steps provided as well as different contents. Data being gathered are also different. 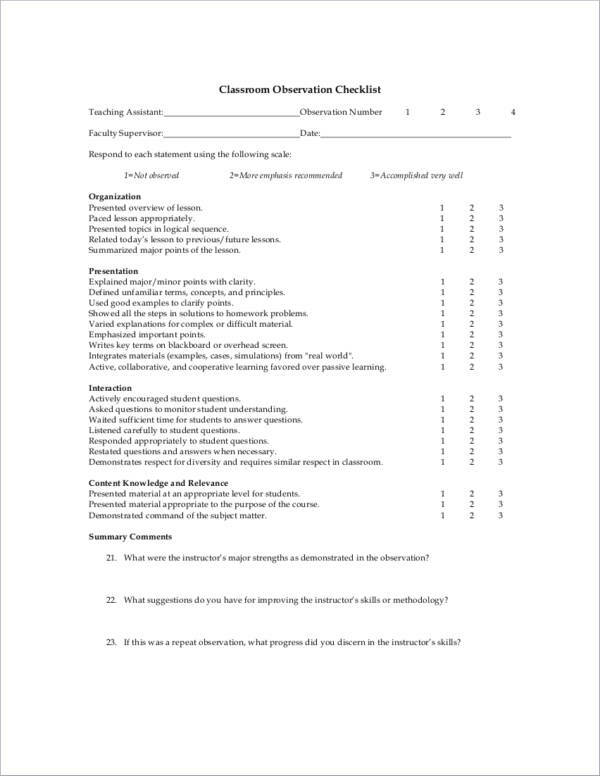 Knowing specifically the focus of the observation will help you determine what type of data to gather and the contents to expect in the checklist. 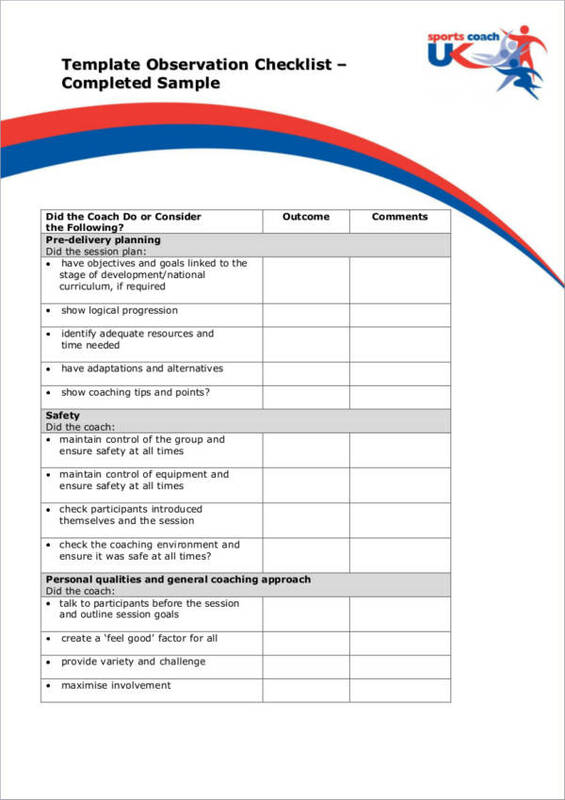 Other checklists that you might find useful are audit checklists and risk assessment checklists. What Activities Are Involved in an Observation? The activities that are involved in an observation largely depends on the type of observation to be conducted as well as the focus of the said observation. It would seem impossible or too lengthy to name all of them considering the fact that they have a lot of differences. Perhaps we should focus on their similarities. While there are many different activities involved in an observation, there are also activities that are used for one type of observation to another type of observation. They are assessment, data collection, and evaluation. Each of these activities are discussed below. During emergency situations, the very first thing that responders do is assess the situation. 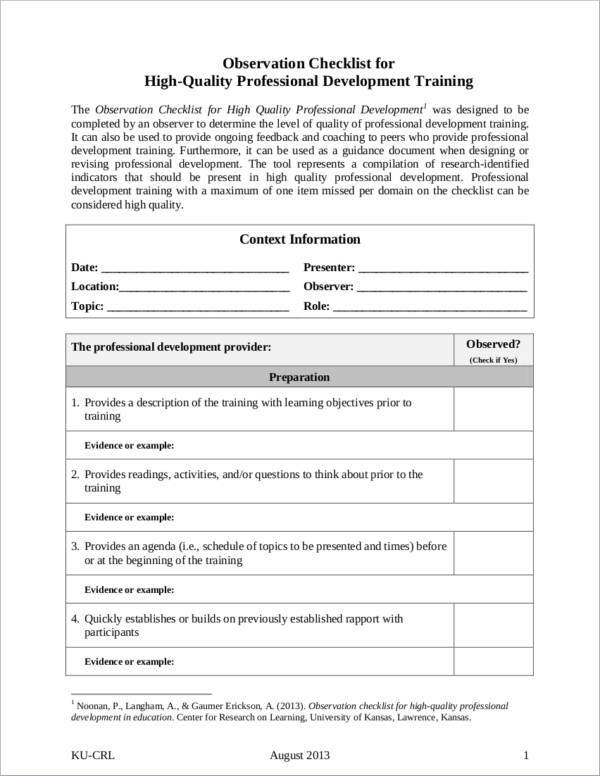 Although observers who conduct an observation use observation checklists for the whole duration of the observation, they still need to assess the situation if it is effective or if it is able to demonstrate the goal of having an observation conducted. 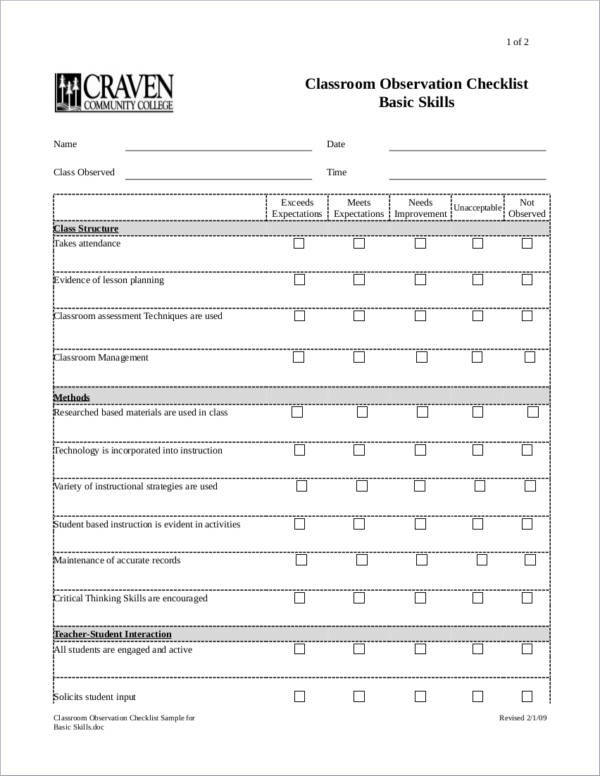 There are different types of assessments and they can be done at any part or stage of the observation process. If an assessment is not done properly, the observation may seem biased and produce low-quality results. The collection of data is essential and an important part of the research process and in writing research papers. The same is true during an observation. Data collection during an observation is as important as it is in the research process. The data being collected will help the observer provide a basis for their evaluation of the observation and at the same time serve as a record that can be compared to the desired criteria. Observations need to be evaluated at the end of the presentation or a performance check. There are times when an observation is being conducted by a panel of judges or by association heads and may take some time to have the results delivered. The evaluation is where the result of the observation will be revealed whether it is a pass or fail based on certain criteria. 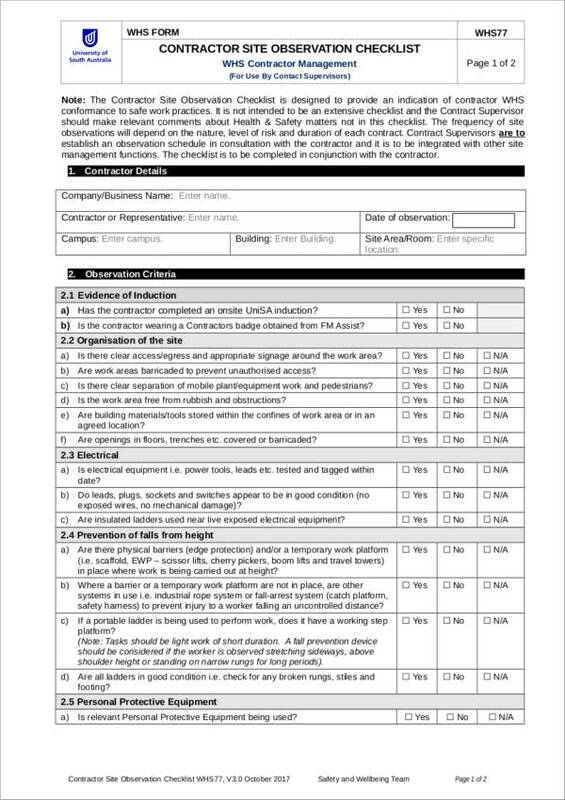 Evaluation forms are used together with the observation checklist during the deliberation of the result of the observation. There are a lot of things that can prove the importance of conducting or making observations. It is not just something that is beneficial, but it is something that is reasonably useful and undeniably effective. Through observations, a lot of things have improved and some flourished. Answers to questions were found and solutions to problems were provided. If that does not convince you about the importance of an observation, then perhaps the list below will. An observation is important because it allows parents to know their children and the rest of their family. It is a must that parents observe their children or any member of their family as this helps them understand each member and cater to their needs.Through their observations, parents will be able to formulate or program the best care necessary for each member of the family. This will lead to a happy and harmonious family relationship filled with love and care. An observation is important because it helps determine how people interact and respond to specific stimuli. We observe people subconsciously or just out of curiosity. Without minding it, we come to know their likes and dislikes, as well as their mannerisms. Employers observe their employees so that they will be able to identify their strengths and weaknesses and at the same time determine what type of employee the person is. An observation is important because it makes it possible to identify or determine issues and provide a solution for them. Through a thorough observation, the root of a problem can be identified and a solution can be given or created. If the root is not identified, at least clues can be determined, which can be done by making or conducting observations. Observation is one of the essential steps that bring success to research studies in a wide range of fields and specifications. Researchers and scientists are able to learn about new things and produce new findings all thanks to their curiosity and impressive observation skills. 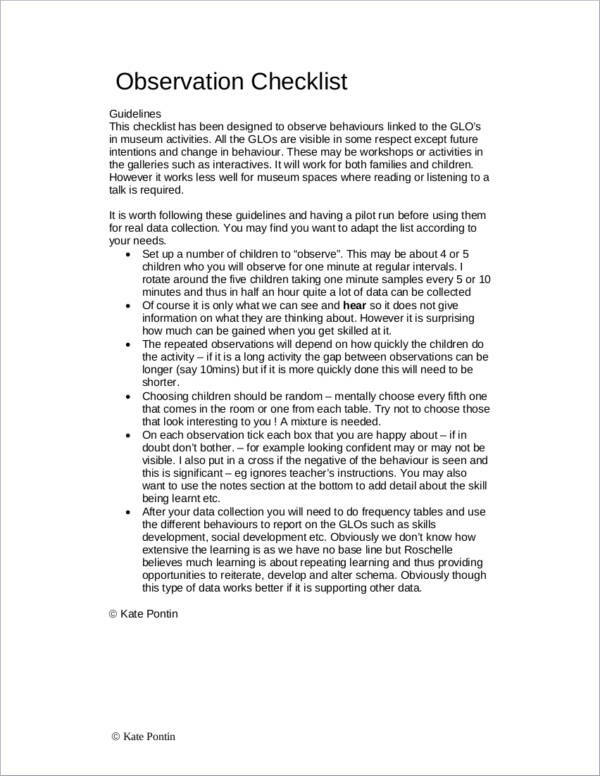 The better they do observations the more data they can gather leading to high-quality results. An observation is important because it helps make our lives better. Inventions, machinery, technological advancements, medicines, and all the things that we are enjoying today are all thanks to the observations made by scientists and inventors. Because they observed, they were able to find all sorts of things that we are using now so that we can live better lives.